Matt Moog is the CEO of PowerReviews, a leading provider of customer review technology to more than 1,000 brands and retailers. Previously Matt founded Viewpoints, the predecessor to PowerReviews, Built In, a growing network of online communities for digital technology entrepreneurs and Wavetable Labs a digital business incubator. Matt is also an active angel investor. He co-founded the FireStarter Fund in January 2012 with Brian Hand, Troy Henikoff, Sam Yagan and 40 other Chicago based technology entrepreneurs. Since launch FireStarter Fund has made twelve investments including Retrofit, GiveForward, Kapow, Shiftgig, Cartavi (acquired by Docusign), Upcity, Hireology, Tap.me (acquired by MediaMath), Food Genius, Mighty Nest, Blitsy and Pangea Payments. Previously Matt served as the President & CEO of CoolSavings a publicly traded marketing services company that was founded in 1996, went public in 2000 and was taken private in 2005 at a valuation of $220 million. Currently Matt serves as the Vice Chair of Chicago Public Media, the Vice Chair of YPO Chicago, and as a board member of Francis Parker School, and of publicly traded VASCO Data Security. Matt has previously served as an executive board member of the Word of Mouth Marketing Association, on the board of the Direct Marketing Association (DMA) 2005/06 and the Interactive Advertising Bureau (IAB) 2004-2006. 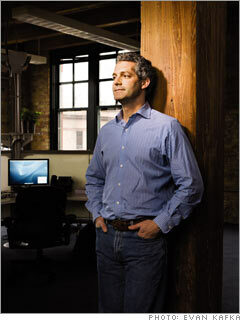 Matt was named to Crain’s Tech 25 in 2011, 12 and 13 and to Crain’s 40 under 40 in 2005. He has been nominated for the Ernst & Young Entrepreneur of the Year Award for both CoolSavings and Viewpoints. Matt has been cited as an industry expert in The New York Times, The Wall Street Journal, The Chicago Tribune, Fortune Small Business, and a variety of other national and regional publications. He has also appeared on Fox News, CNN, CNBC, WGN, CBS 2 Chicago and WTTW to discuss the future of digital media. Matt holds a BA in Political Science from the George Washington University (’92). Matt is married, to Lucy, with three boys Max , Charlie, and Eli.